Spring is really kicking in at last! Here’s a flower you can expect to see soon, a non-native species that arrived with European settlers, perhaps for use as a cough suppressant. 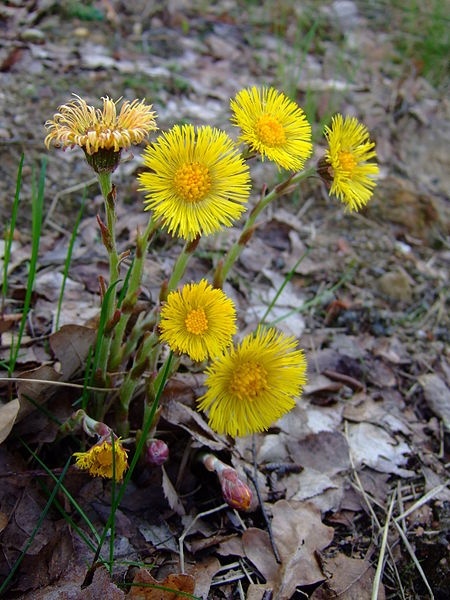 Coltsfoot (Tussilago farfara) is one of the earliest flowers to bloom. It grows in waste places so you’ll see it by the side of the road. Ducks, ducks and more ducks! Look for these migrants on local lakes. More songbirds will arrive including tree swallows, eastern phoebes, eastern meadowlarks and eastern bluebirds. Watch for blooming forsythia, snow trillium, harbinger of spring, violets, and of course coltsfoot. Frogs are singing and mating. I heard spring peepers at Middle Creek last weekend. And if you hear ducks quacking from the ground in a swampy area, it could well be wood frogs. Years ago I was fooled by wood frogs at Friendship Hill as I searched and searched an empty wet field for ducks. None. Eventually it dawned on me. Wood frogs! Skunks and groundhogs are coming out of their winter dens and dining along the grassy roadside edges. Watch out when you drive! They move slowly. American woodcocks (also called timberdoodles) “peent” and twitter in their aerial mating dance. I heard one very close to my car before dawn at Middle Creek but could not see it. Here’s what I heard. Peregrine nesting season is in full swing and I will do my best not to make this blog into “All Peregrines All the Time.” Oh, it will be hard! Look for signs of spring in your neighborhood and let me know what you find. Coltsfoot was called “son before the father” by the Native Americans, because the blossom did appear before the leaves. They also dried and powdered the leaves to make a salt substitute. Not in my neighborhood, but little baby owlets falling from their nests is a sure sign of spring! I just saw some Coltsfoot in Riverview Park this weekend. I didn’t know the name. Now I know. There are snow drops up in the garden next to my house and there are crocus blooming in the rock garden of the National Aviary.